MAGNOLIA is a brand that has accompany most Singapore residents to grow up. I am one of those who have gone through the “MAGNOLIA tetra pak” era, and it will always stay as part of my childhood memories. 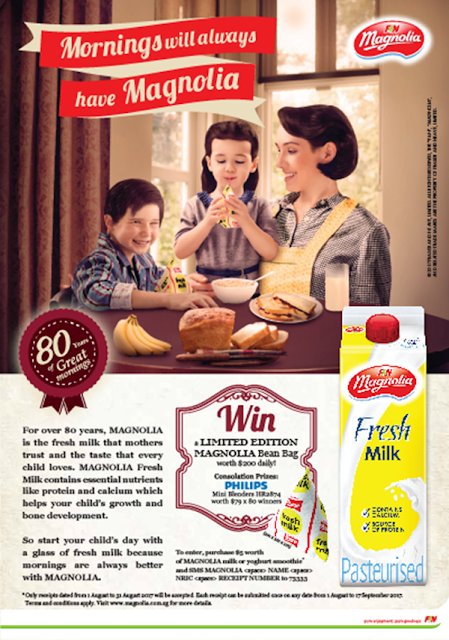 MAGNOLIA has been devoted to nurturing good health through the pure goodness of milk for the past 80 years, and has earned its accolades as one of Singapore’s most trusted brands in championing nutrition for all ages. always something for everyone in the family. Both the MAGNOLIA Lo-Fat Hi-Cal and MAGNOLIA Plus range have been certified as Healthier Choice by Health Promotion Board (HPB). Feeling lucky? 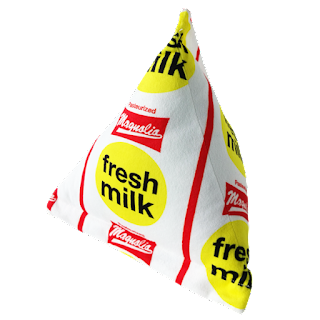 In the spirit of celebrating MAGNOLIA’s 80 years of heritage, MAGNOLIA will be giving away 31 exclusive Bean Bags (1m x 1m x 1m) in the shape of the iconic pyramid pack (worth $200) and 80 Philips Mini Blender HR2874 (worth $79) to their loyal consumers. Receipts dated from 1 to 31 August 2017 will be qualified for the lucky draw. Each receipt can be submitted only once at any day between 1 August 2017 to 17 September 2017. Winners will be announced on MAGNOLIA’s Website on 29 September 2017. Terms and conditions apply. For more information, please visit www.magnolia.com.sg.